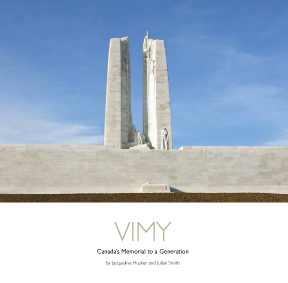 The book, published in 2012 by Sanderling Press, was written by Jacqueline Hucker, an architectural historian and the historian on Vimy’s restoration team, and Julian Smith, a conservation architect who was the co-leader of Vimy’s restoration team. A mix of historic and recent photographs illustrates the text and evokes a sense of scale, emotion, and importance of the monument and its surrounding landscape. A testament to Canada’s commitment to commemorate the sacrifice of almost 60,000 Canadian soldiers during the First World War, Vimy: Canada’s Memorial to a Generation traces the history of the monument at Vimy Ridge, from the inception of the idea as early as 1919, through to the restoration of the monument in the early 2000s and its rededication on the 90th anniversary of the battle in 2007. The narrative focuses on the architectural significance of the memorial itself, breaking from the traditional monuments to Canada’s war dead, paralleled in significance of the Battle of Vimy Ridge to Canada’s history and national identity.